The Newtown Vintage Market is giving people a chance to work for themselves, under the new leadership of Nomie Julian. The market is almost three years old and Nomie is the third person to organise it. She took it over a few months ago after no one else wanted the mantle. “I didn’t really want to see it die,” she says. The market was largely vintage clothes but Nomie is expanding it to include crafts, art, vintage clothing, quirky items, baked goods and beauty care products. Nomie initially joined the market to sell her crafts, like dream-catchers and gemstone jewellery, and because she wanted to get back to working for herself, and she is not the only one with that goal. There has been a 6% rise in self-employed people between 2014 to 2017, according to the Ministry of Business, Innovation and Employment. Roughly 8.6% of Kiwis are self-employed, a total of 410,109 people, according to the ministry’s annual small business fact sheet. Over 6% of self- employed people are in the retail trade. The Newtown market gives a chance for regular people to grow their businesses. “Every month I try to bring new people in so there’s a wide range of different things,” Nomie says. Even teenager Thomas is using it to start his own business baking cakes, while still at high school. “I’m attracted to being my own boss,” Thomas says. Vintage Galore’s Carol says the best part for her is helping clothes find homes, even if it is at a discount. For Eleanor Machiela, who sells handcrafted cards with recycled prints it’s a way to make use of her creative hoard. “It’s just a really cool opportunity for people to show us what they’ve been working on,” she says. 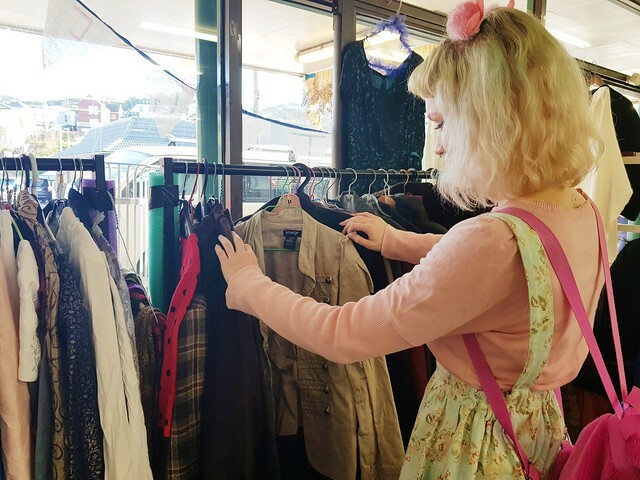 The Newtown Vintage Market is warm environment to build up people’s brands. “It’s really friendly. It’s really supportive round here,” says Eleanor. It seems to be Newtown locals that come to the market regularly and people who have happened to spot the sign. National statistics for self-employment show 38% women 62% men every year. Most of the growth in self-employment over the past decade started with the older generation while self- employment of younger age groups has fallen, according to the MBIE 2017 small business fact sheet. Roughly 45% of self-employed people are over 50, says the report, which is based on Statistics New Zealand figures. Since 2014, the number of small businesses born has gradually risen to around 10,000, after a slump of 6000 in 2009 in the wake of the 2008 Global Financial Crisis. The Newtown Vintage Market takes place the first Saturday of every month at 199 Riddiford Street.